Simon’s Cat has teamed up with his friends to teach Mr. Potts a lesson he will never forget. You must help him and his kitty buddies rescue trapped critters and the best way to do this is to use their special powers. You can use Chloe’s butterflies to set off a mini-explosion or send Maisy’s bees on a bubble-popping mission. You can also combine two or more power up to clear lots of bubbles. Each power-up has a unique effect and a combination of different powers can help you reach your objectives and earn three stars before running out of moves. Simon’s Cat Pop Time’s spectacular power ups are a treat to watch (pun intended). With these tips and tricks, you will know how to make the most of them. You will also learn various combinations and their effects. 1. Chloe loves everything pink, including her treats. You will have to pop pink bubbles to feed her. The treat gauge underneath her feeding bowl must be filled up to use her power-up. When full, tap her to get a special “butterfly” bubble. You can fill her bowl instantly with treats by tapping the “+” sign beside the treat gauge. You will need to spend coins to buy treats for her. The butterfly bubble explodes when it lands. Use it when you can’t find any same-colored bubbles to pop. It does remove a chunk of bubbles, so use it to target trapped critters that are close to it! I love how several butterflies flutter away when the bubble explodes. 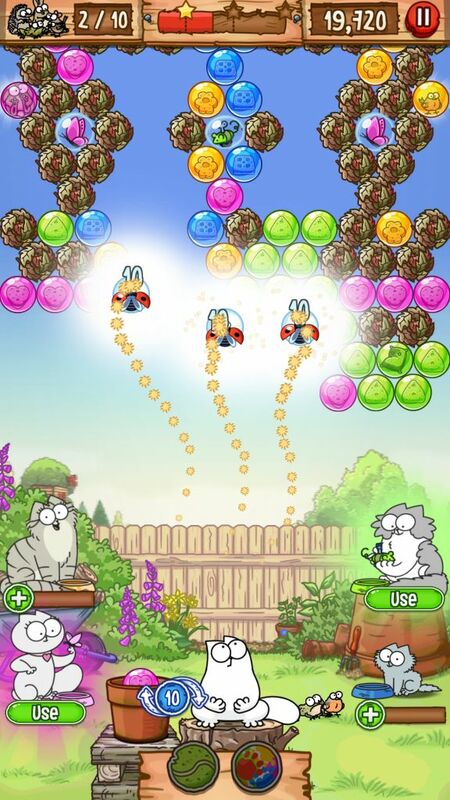 You may also find the butterfly power-up among a group of bubbles. Pop it to clear a large area. 2. Kitten loves to gorge on blue treats. Pop some blues to feed him. When his treat gauge is full, he gifts a ladybug bubble. Launch it and it will clear all bubbles on its way up. Please note that it cannot clear obstacles and they will bock its path, so make sure you don’t aim at an area having rocks and other objects. 3. Jazz can’t live without green treats, so pop them to grab his powers! He will give his prized toy mouse bubble that clears a row it lands on. Jazz’s toy mouse can be very helpful if you want to take down several bubbles at once. All you have to do is target a row that’s connected to several rows of bubbles. When the toy mouse clears that row, all bubbles below it will fall down. 4. Maisy prefers yellow treats over others and grants a unique bee power-up. All you have to do is clear yellow bubbles to feed her and get the power-up. When you launch it, three bees will travel in three directions clearing bubbles on their way up. You can use Maisy’s power-up to clear bubbles when you can’t find any matches. – Combining Chloe’s butterfly with Kitten’s ladybug power-up will launch two powers – one will clear a large area and the other will clear bubbles on its way – all at once. – Launch the combined powers of Chloe and Maisy. Bees will travel in three different directions and will explode when they land. A triple-explosion of butterflies will clear lots of bubbles. – Mix Chloe’s power-up with Jazz’s toy mouse and the butterfly explosion will spread out to a row. With just a butterfly power-up, the blast radius will be small. When combined with the toy mouse, you will be able to clear several bubbles. – Combine toy mouse with the bee power-up. When all three bees land on a bubble, they will turn into mice clearing several rows at once. – So what happens when you combine the toy mouse with Kitten’s ladybug power-up? Well, the mouse clears the row and the ladybug travels up clearing any bubbles that come in her way. Not an impressive combo effect. – I love the bee-ladybug combo. Use them together and all three bees turn into bugs and clear lots of bubbles on their way. Simon’s Cat Pop Time’s power-up combos can be fun if you know how to use them in a proper way. Try to combine three different power-ups or four to get a super combo and clear lots of bubbles to complete levels faster. 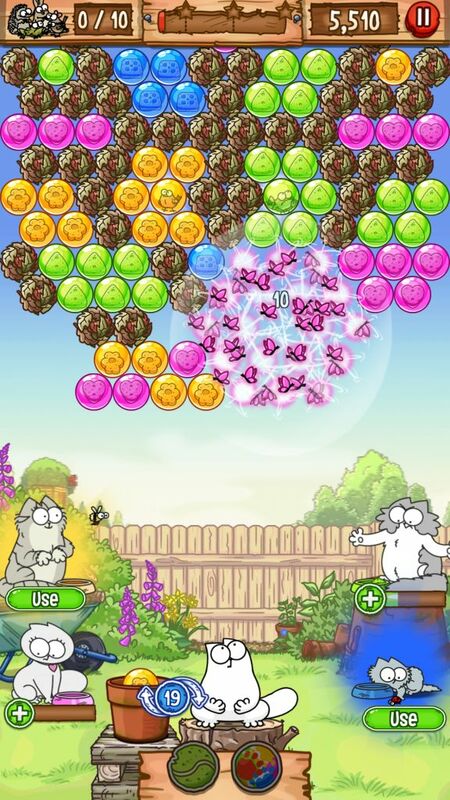 Did you find any new kitty combo effect? Please share it with us by leaving your comments in the section below. Pull down to see where to aim? Unfortunately, there isn’t any way to see the top. You can use owl vision booster to extend the aiming line to get accurate hits. You will have to get rid of bottom bubbles to bring down the top bubbles on the screen. What good are all the points you amass that are located in the top right of your screen? Can they be used for anything? And if so, how? Thanks! In each level, points convert into stars. The more points you earn, the faster you reach three stars in a particular level. Keep scoring more points to fill the stars on the top of the screen. How do I clear the rocks? I have tried every combo in this game and still can’t do it. You will have to target bubbles that are linked to those rocks. So if there are bubbles at the top of the rocks and those rocks are connected to them, then target those bubbles. This will make both bubbles and the linked rocks fall down. You can’t destroy rocks, so this is probably the only way. You can use Jazz’s “toy mouse” power-up to do this. What exactly is an Oscar frenzy? I did the four combo and all I got was the bird carrying the dog and it didn’t do much to help me. Wasted my bonuses. I don’t like that there’s not an easy explanation guide. I think it told me what Oscar frenzy was when I started but that was a month ago and I don’t remember. When you combine powers of all four cats, you will get a tennis ball, which you can shoot at a cluster of bubbles. When you do this, a bird carrying the dog will appear on the screen. You will then have to swipe the screen. As you swipe the screen left to right, the dog also swings, clearing any bubbles that come in his way. When you start swiping, the bird slowly lifts the dog upwards and he starts clearing bubbles as he moves up.